The TRDATA Platform is Now on Mobile! 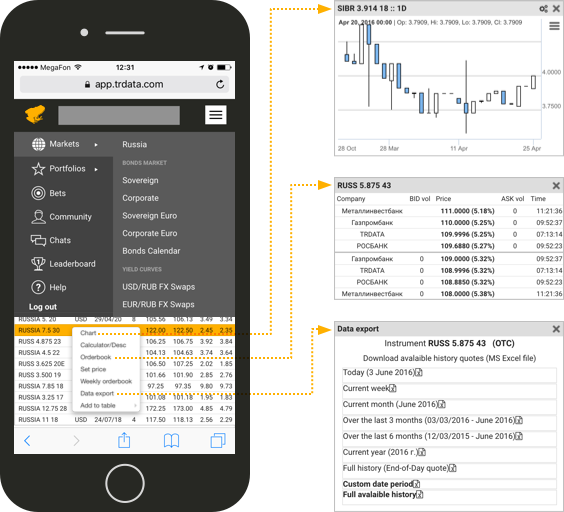 In the mobile version of TRDATA, you are always connected to the market and can watch for changes in prices from any device. Here are just a few of the features of the platform that you can access from your phone. TRDATA Just Got a Sleek New Design! We are pleased to announce the release of an update to the TRDATA platform, now with completely new panel and menu designs! Here at TRDATA, we are always striving to optimize the user experience and the platform’s functionality. We are proud to announce the release of two new widgets on the platform: the Eurobonds Market Map and the Local Russian Market Map. 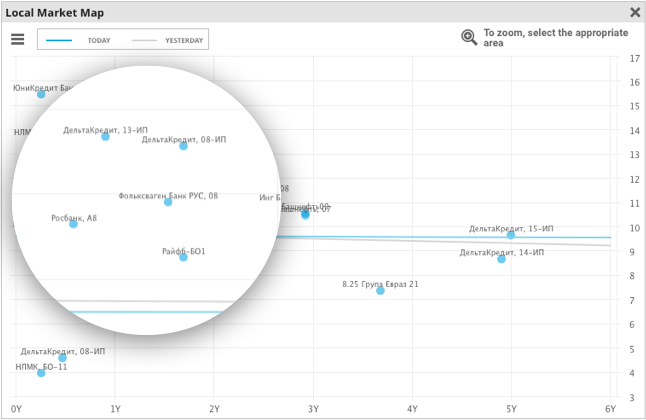 These two widgets allow you to view all real-time bonds on TRDATA in one convenient graph of yield over time. We are happy to announce that users can now view high-profile finance, investment, and advisory jobs from FinExecutive on the TRDATA platform. We are happy to announce that users now have access to FINAM news and analytics directly on the TRDATA platform. FINAM is the largest brokerage firm in Russia and offers its corporate and private clients a wide range of investment services. Did you know TRDATA has a Bond Calculator that lets you view and calculate important bond information? Here are five useful functions to make your trading more efficient. Our team at TRDATA is always striving to improve our platform design and optimize the user experience. 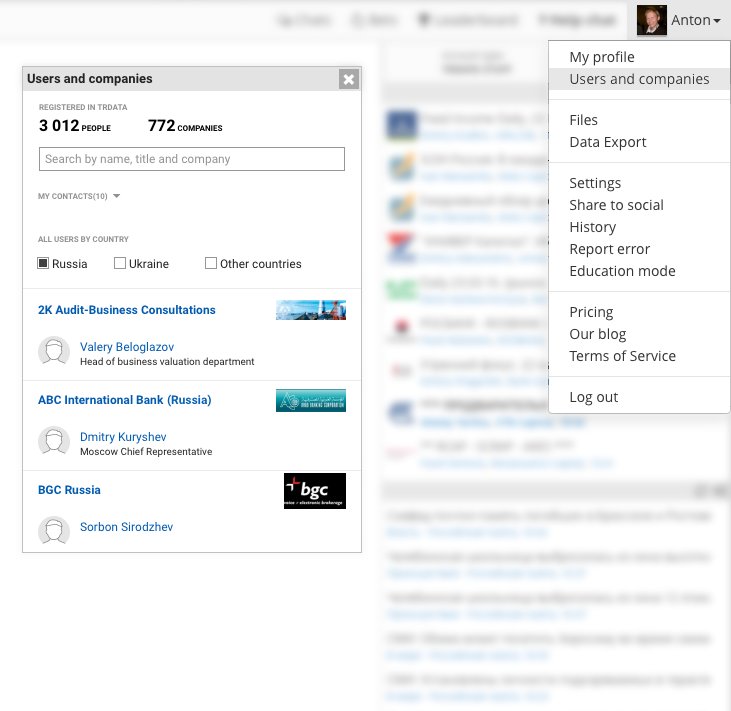 Today, we are happy to announce the release of an update to our Users and Companies menu. You can access the menu by clicking on your username at the top right corner of the platform. 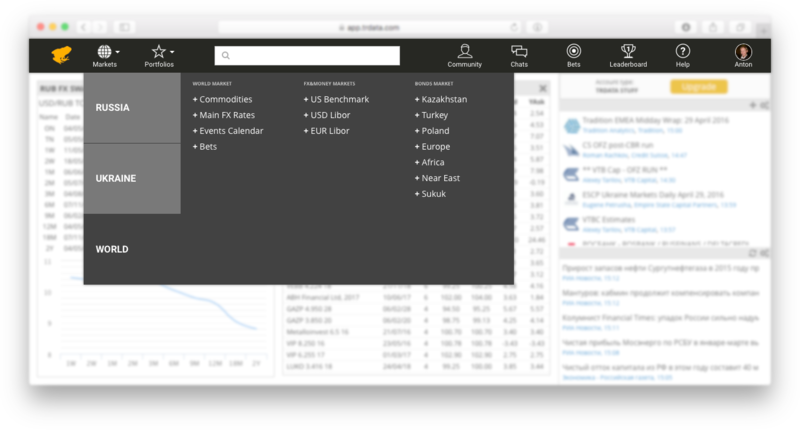 TRDATA instrument – Financial Tote with bets for major economic indicators, has now new beautiful design. TRDATA users can now enjoy Intellinews newsfeed directly from out platform. bne IntelliNews is one of the leading business news publishers on emerging markets with coverage of Eastern Europe, Central Asia, Africa and the Middle East. We try to make communication between TRDATA users as efficient as possible and that’s why we are happy to introduce the new user profiles. Now you can enjoy the new profile interface, as well as the ability to add your social account information and check Facebook and Twitter accounts of other members. Over the past few months, we’ve been working on adding new global instruments to TRDATA platform. Today, we’re excited to start translating data for bonds on global markets. Now you can check real-time prices on bonds from Europe, Africa, Middle East and Kazakhstan provided directly by international banks. TRDATA is a platform where you can get information about various sets of financial instruments. If you’re not familiar with it yet, below is an overview of some features of the platform, which traders find extremely useful for performing the best trades at the best prices every day. So let’s look deeper at what’s inside the platform.. The number of instruments on our platform is growing and now you can check Bitcoin prices right from TRDATA Platform. Log in and check now!